Due to a massive improvement in manufacturing techniques and people becoming more and more aware of the long term environmental benefits artificial grass can offer, it is now becoming very popular and is being seen as a real alternative to natural grass. 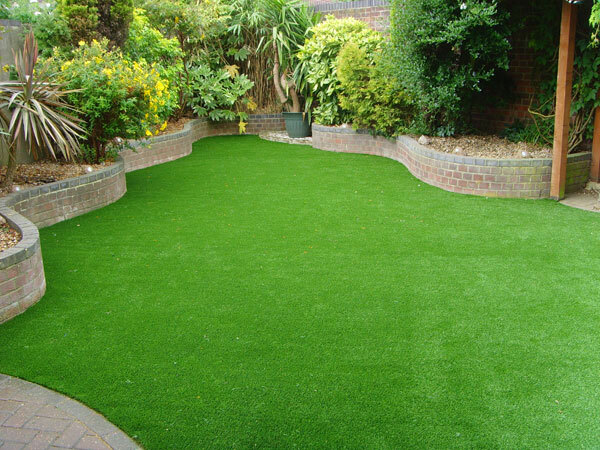 In the past Artificial Grass or Astro Turf was usually limited to sports and recreation centres, but with it now designed to feel and look so realistic, it is becoming so popular amongst the general public that you are just as likely to see it laid in your neighbours garden. The first benefit being the changes it can make to your lifestyle and how easy it is to take care of. Mowing your lawn is one of the less glamorous jobs that we do on a regular basis during the summer months and can take up to 3 hours of your time depending on the size of your garden. In this day and age it seems that we all now live our lives at a hundred miles per hour and our own personal relaxation time has became a valuable commodity as we try to juggle our daily responsibilities, so you have to ask yourself the question, do you really want to be spending this time mowing and taking care of your lawn? 1. Once laid artificial grass needs very little maintenance, which in turn frees up all the time you would have spent in the summer months mowing your lawn, allowing you to do something more productive and enjoyable with your time. 2. Artificial grass is ideal for older people who can no longer manage the physical aspect of looking after their own gardens and now either rely on family and friends or pay a professional gardening company to take care of it. The beauty of artificial lawn is, once laid it takes very little time and effort to care for. It has also became a very popular option with Holiday home owners who only tend to visit their properties occasionally, usually at the end of the holiday season so don’t have the time or resources to care for their lawns properly, meaning they have to employ a professional company to take care of it in their absence. In recent years in the UK we’ve seen increased restrictions being put on water usage in the form of hose pipe bans. This is bad news for natural lawns. A natural lawn that isn’t watered in hot weather can be permanently damaged in the space of days, this is one worry you don’t have with artificial lawns. Meaning installing artificial grass actively helps the environment through substantially reducing the water usage per household. • Artificial grass is a great surface for use in dog or pet runs as its very easy to keep clean and sterile, making it a particular favourite with dog kennel owners. • It makes and excellent substitute for natural grass around swimming pools as it means no muddy areas where dust and dirt can be carried into the pool by dirty feet, which you would normally get with natural grass. It also stays green and pleasant to look at whatever the weather conditions. • Its also great for high usage areas of you garden where there is constant footfall i.e. children’s swings or slides etc. where it can be carefully laid to blend in with surrounding features and eliminate muddy areas, leaving your garden looking in top condition throughout the summer months. • It can also be used for roof gardens in properties where the roof just isn’t strong enough to support the weight of a natural turf. With Artificial Grass you don’t have the weight issue and you don’t have the hassle of cutting it.